It took a while to convert my old static pages hosted in DreamWeaver. There is a lot of benefit to be derived from doing so, but there are things to know. This page summarizes the essential lessons. Site-Relative Links Work. File-Relative Links Do Not. In general, WordPress handles images pretty well. In a post, you click [Add Media], which takes you to the Media Library. From there, you can click a thumbnail to use and existing image, or click Upload Images tab to upload a new one. At times, though, the thumbnail for an uploaded image does not appear in the Media Library. The link to it works, and it appears when you edit it, but for a thumbnail all you get is a gray or black box — and when you insert such image into the post, nothing appears. (If you examine the HTML text, you can see the reference to the image, but nothing shows up in the editor unless you’ve specified a caption or Alt-text (alternative text that appears when the image is absent). An image with a transparent background. Such images do not appear to work in WordPress. However, it is possible that it was actually experiencing problem #2, and that I unknowingly rectified the issue when I re-saved the image with a white background and uploaded it again. I had a bunch of text files, spreadsheets, and MP3 files to link to, in the files I converted. In DreamWeaver, that was easy. Just put them in a folder near the article, and access them using a relative link like ../files/someSpreadsheet. But in WordPress, links are absolute — and there is no place to put a raw file. You can, of course, upload the files to the WordPress Media Library. That works great for images. The images display as large icons, which makes them easy to find a select. But if you have 10 spreadsheets, they all have the same icon. You can read the names, of course, but all those identical icons just muddy up the waters, making it harder to take advantage of the Media Libraries ability to help you find images. My solution was to create a files subdomain. That turns out to be pretty easy in the CPanel admin system that SiteGround uses. When you create the subdomain, a folder is with that name is created for you in your public_html/ folder. After that, it was simply a matter of creating a hierarchy under files/ that matched the category hierarchy I created in WordPress. So where /some-category/some-article.html used to reference /some-category/files/some-spreadsheet.xls, that spreadheet now resided in /files/some-category, and the link to it became https://files.yourSite.com/some-category/some-spreadsheet.xls. The Media Manager is terrific for images, and for a small number of files. It will actually handle quite a few file types, but it always displays generic “block” image for a file, which takes up space without telling you anything. If you have a large number of files — especially if you have a large number of categories — you need media categories, to make it easier to find things. There are a couple of plugins that will let you create categories on media, and they’re free. But to USE those categories, you need to send them money. Another way to do it is to create a subdomain for the site. I chose files.treelight.com. Creating the subdomain creates a directory (folder) on the server, at /public_html/files. FTP can now be used to upload files and retain the folder structure. That way, a root-relative link like /essays/images/abc.png can be converted to https://files.yoursite.com/essays/images/abc.png. But to keep the folder structure cleaner, I also dispensed with the images/ subdirectory. When your site goes live, you’ll be accessing it with your domain name (www.yourSite.com). But before then, you’ll be accessing it using an “IP” (Internet Protocol) address — a 4-segment number like 123.456.789.256. Translating a domain name into an IP address is what a Domain Name Server (DNS) does — and that’s why you need to set up DNS records to make your site go live. But until that happens, you use the IP address to access the site. Because until the DNS records are created, yourSite.com doesn’t really exist, as far as the web is concerned. In DreamWeaver, that’s not a problem. You make all your links relative (either to the site root or to the current file, your choice), and you don’t really care how the site is accessed.So all of your links go to /some-file. But in WordPress, all links are absolute links. So links will eventually go to https://yourSite.com/some-post. But those links won’t work right now, so they have to go instead to https://123.456.789.256/~username/some-post, where the numbers are your IP address, and “username” is the Linux username your hosting service saddled you with. The fact that links are absolute gives you a problem. WordPress makes it spectacularly easy to add a link to another post — that’s one of the features that makes it so attractive. But when you do, the link goes to the URL you used to access the site, and in the initial stages, that means the IP address + username. In the long term, of course, you want the links to use the site name. Which means that you’ll be doing a big search-and-replace in the database later, to correct them all. But a bigger problem with IP-address access is that there is no way to access subdomains. So if you created a subdomain for your files, as suggested in the previous section, there is no way to be sure the links work properly until after the site goes live — unless you use the hosts file. Long after my site was ready to go live (unfortunately), I found out about this capability in a help page at SiteGround (whose technical support is excellent, by the way). The page was How to Use the Hosts File. After you do, you clear your browser cache so any pages you previously accessed are reloaded, and Voila! Your system is accessing the site via the domain name, yourSite.com — while to the rest of the world, the domain name still doesn’t exist! If the category is specified as well, the permalink will never contain the subcategory. You can specify more than one category or subcategory, but the first one found will always be used as the permalink for that post. Folder categories are “clickable”, in that you can adjust the URL for a post or click its breadcrumb entry to see all of the posts in that category. When a link is generated the %category% pragma expands to the category and subcategory the post is in, so the URLs reflect your intended hierarchy. A category sidebar widget that keeps all categories collapsed except for the category of the post your are viewing in would be ideal, but I haven’t found one that works well enough yet. Another way is create pages that match your category hierarchy. Add a heading element and a blog element for each subcategory, and put a “subcategory menu” across the top of the page. In general, teasers for posts look much better in a two-column format, if they have a “featured image” that displays at the top. The two-column format keeps the images small. In a single column, the images take up most of the page. One way to have a page with multiple categories is to create a row that is divided into multiple columns. Each column then has one subcategory. But if one subcategory has more posts than the one next to it, it leaves a blank area on the page. A better way is to set the blog-element display to the two-column format, rather than the single-column format. Ideally, it should be possible to use the same CSS list-style that the main menu uses, to put the subcategory list at top of page. Create separate pages for the subcategories, and create links to those pages. With your categories set up, you can then turn on breadcrumbs for posts, which displays the categories a post is in (each is clickable). You can also create Menu items that match your category hierarchy, using either Category items or the pages, if you created them. Changing the category pages would seem to require modifying the WordPress PHP code. That gives you the same effect as a menu item that goes to that category, but instead of the awkward title, “Archive for the Category: X”, you can create a title you want, like “Essays” or “Golf Articles”. Alternatively, you can have multiple blog elements on the page, one for each subcategory. In either case, the trick is show readers the possible subcategories, and give readers an easy way to get to them, from that page. However, the subcategory TOC would work better as a mini-menu list across the top of the page. Rather than as a vertical TOC. The next problem is then the links in any tag cloud or category listings that appear in your sidebar link to the default “Archive of” category pages, instead of to pages you create. 1. The issue stems from the fact that subcategories aren’t really subcategories. For that reason, they all have to be unique (which is fine). 3. The real problem is that a subcategory cannot be accessed using a URL like https://yourSite.com/category-name/subcategory-name. That URL does not work. So even though your post URL is https://yourSite.com/category-name/subcategory-name/post-title, a user can’t simply chop off the post title to see other articles in that subcategory. They have to know to remove the category name from the URL — all of which represents a small defeat for the hierarchy you were trying to create. Although the title appears smallish, it’s still an H1, which satisfies SEO. Custom post-page title should be OFF, so that post title appears in the banner of the page. Posts page needs to have title “Articles”, “Posts”, or “Blog” to appear with that name in the breadcrumbs. The big issue with WordPress is that absolute links are stored. Instead of storing relative links or, better, a database ID in link fields, absolute links are stored that name the site, the category/folder that contains the page, and the page name. If you move the site, all links in the site need to change. If you change the title of a post, existing links are not automatically adjusted. If you delete a post, you are not warned of links that will be broken. A file relative link (href="foo") from a post in the golf category becomes a link to https://yourSite/foo, which fails. But a root-relative link (href="/golf/foo") works perfectly. The caveat is that it fails while the site is private! The link to /golf/foo fails in that case, because it becomes https://yourSite/golf/foo, which doesn’t exist. The link will work perfectly when the site has gone public, though, because the golf pages will be reached at https://yourSite/golf. 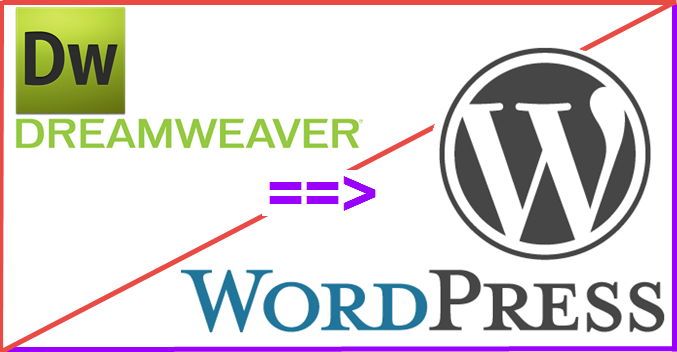 Neither DreamWeaver nor WordPress has an option that will change file-relative links like ../images to /essays/images. But in DreamWeaver, you can do a folder-by-folder find and replace, to make right change. In WordPress, there is no such thing as “folder”, so there is no good way to change to /essays/images in some articles, and /golf/images in others. However, that changes only really work for links to files. So a link to a spreadsheet or an image can become an absolute link to your file-storage subdomain, which will save you a ton of grief over uploading to the WordPress Media Library, and then fixing every link on every page. The good news is that the longer, hyphen-separated article names are not only more descriptive, they are also search-engine friendly. Search engines can parse the title for keywords, and your page ranks higher, because of that. The bad news is that any and all links to that page from other sites are now broken — so a page that was once at the top of the search rankings is now at the bottom. Then, after your site goes public, tell your service provider to set up a permanent redirect, giving the old URL and the new one. So in the example above, /health/nutrition/Wheat.html redirects to /health/nutrition/whats-wrong-with-wheat. Tell visitors what happened when a link is broken: a) Try searching for it, since the name and possibly it’s location has changed and, b) If all else files, try changing the URL (to classic.treelight.com, in my case). [+] You don’t have to do anything to create them. [-] They have awkward titles like “Archive for the category: Essays” and “Archive for the category: Golf”, instead of titles that make sense like “Essays” and “Golf Articles”. And you can’t add intro text to those pages. Note: The 2-column format for blog rolls keeps “featured images” at the top of the page from taking up too much space when teasers are displayed. Alternatively, you can manually create a page for each category. [+] Pages have the titles you want, and you can add intro text. [-] Blog elements don’t have a 2-column format. You can get a similar effect by creating two columns, but then each blog elements needs to display posts in a subcategory. Works well if there are two subcategories. If there are more, then a) You need a menu across the top and b) You get awkward spacing if a subcategory has more posts than the one it is next to. [-] In a blog element, selecting a container-category doesn’t automatically include posts in subcategories. One option would be to put a post in both the container-category and the subcategory. However, that post is disliked by search engines (multiple locations for same content). Another option is to select all of the subcategories for the blog element (works great, until you change a subcategory name or add a new one). Lacking a built-in capability, the only way to solve the problem is to hack the Php code that constitutes WordPress. Somewhere, there is a generic code that creates the title “Archive for the category:”, and tacks on the category name. That could become a series of if/else-if statements the examines the category name (or slug) and creates the desired title. [+] You get the titles you want. [-] You have to redo the hack after every update. Some plugins let you substitute text on a page before a post is displayed. That sort of thing could be used for pre-release documentation, to hide the product name until launch. If one does, it would present a potentially useful solution. The standard portfolio page uses the project-order specified in the project definitions. Learn more: Converting to WordPress: Benefits and Drawbacks, Getting Started with WordPress.